When it comes to improving your translation skills, the natural reaction is often to devote additional hours to that all-important source language savvy. However, despite the undoubted centrality of this skill set, there remains another area that is often inexplicably relegated to an afterthought in translator training in spite of its overwhelming importance: the ability to write well in your target language. Indeed, given the widespread nature of the misguided assumption that bilingualism equates to good translation, newcomers to the industry could almost be forgiven for thinking that foreign language skills are the Holy Grail of translation excellence. But it’s not that simple. Translation is a product-oriented activity and, as such, your hours of hard work take the form of a target language text that is often used as the sole indicator of your ability. Quite simply, it doesn’t matter if you understood the source text perfectly if you can’t convey that mastery into your target language. Of course, the unfortunate stereotypes work both ways: just as somebody who can speak two languages isn’t automatically a good translator, simply being able to write doesn’t make you a good writer. 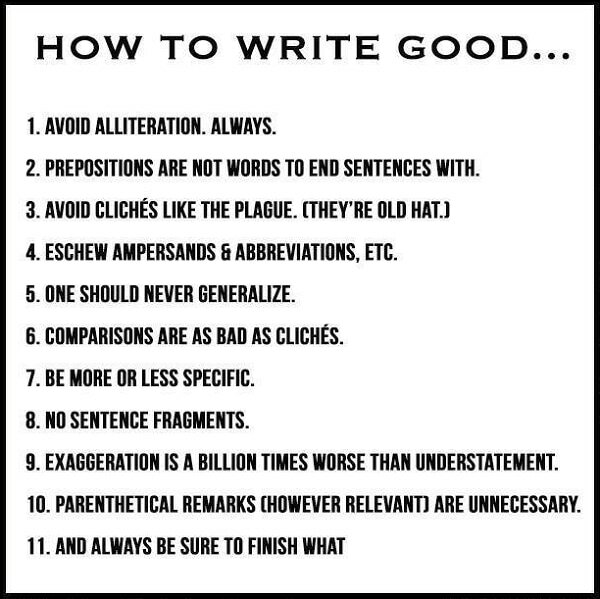 With that in mind, here are a few quick tips drawn from my own continuous efforts to improve that will (hopefully) help you up the level of your writing . If you have any further suggestions, feel free to leave a comment below! An obvious place to start is by tackling texts that directly address the issue. There are millions of words out there devoted to the subject and we all need a few tips on grammar, punctuation, spelling and the like from time to time. Newspaper articles, blogs, infographics and even style guides are all valuable sources of information that can give you a quick boost. How could I leave this little gem out? One of the main reasons for starting my blog was to provide myself with a space to hone my writing skills, focusing on my ability to share information with a specific audience in mind. Reading early posts, it is striking how much my writing has changed over the years (hopefully for the better) and this body of texts is both a sign of my ongoing commitment to improvement and a useful way of gauging progress. Give it a try. For those of you who don’t fancy writing a blog, whether due to the hassle of committing to a regular output, shyness about sharing your posts or a desire to experiment with a new style of writing in private, why not write for friends, colleagues or family members who are willing to cast a critical eye over your efforts instead? Of course, it’s important to find somebody with the necessary expertise and a willingness to openly offer criticism and alternative solutions rather than unconditionally praising everything you write, but feedback from a trusted source can be an excellent way to progress. One thing that I’ve found to be extremely helpful over the years is writing for various websites. This provides you with the opportunity to write in a different context to the comfortable surroundings of a blog post or personal practice run, for which you can set your own flexible style guide, and also allows you to get honest feedback from experienced editors. There are hundreds of sites out there looking for contributors and, best of all, you can target subject areas that correspond to your translation specialisms. In order to focus on my specialist area of sports translation, for instance, I worked with a number of sites writing about Italian or French football in English. Subsequently, I made several new contacts in the field who have introduced me to clients on the back of my translation and writing work for their sites. While feedback from a professional editor is the ideal, critically assessing your own writing remains an important skill. Self-proofing can be a tricky business as it is all too easy to become immune to the peculiarities of your own style, but I’ve always found that reading aloud makes a big difference (check out this article for some more excellent tips on self-proofreading). If you find yourself tripping over a particular phrase when you read your writing, chances are that it is not merely a slip of the tongue but rather something in the text that is restricting the flow. Furthermore, while more elusive elements such as excessively long sentences are easily glossed over when reading your work silently, you’ll soon spot them when you’re gasping for breath after struggling past the umpteenth clause of a never-ending phrase. My final tip is an important one. Beyond simply writing, read texts by famous authors or professionals in your specialist area that were written in your target language. Examine their language usage, question what it is that is unique to that particular style of writing and try to pinpoint what it is that makes one text more engaging than another. Ultimately, developing your writing skills is an ongoing process that will never reach a final destination. Perfection is not required but be sure to avoid complacency, there is always room for improvement. One final caveat: please bear in mind that while the tips above will help your writing skills, it is important that they are considered with the practical application of translation in mind. Writing as a translator is a different beast to producing original texts as, rather than having an infinite selection of words and phrases at your beck and call, you are tied to the message in front of you. As such, it is more than just a case of writing well, it is about writing well within the strictest of confines. Where is the line between fidelity to the source text and the importance of conveying the core message to the target audience? What is it that you like or dislike and why? How does the target language version read? Remember, there are a lot of bad translations out there so don’t blindly assume that because somebody else has opted for one rendering you must do the same, think critically and offer your own solutions.